It occurred to me today, having come across the photos below, that it would be fabulous if South Eastern Railways (or rail track, or whoever would be responsible) were to run a steam train journey for commuters instead of the usual trains. This could take place once a month on a Friday and would give commuters something to look forward to and maybe (going out a limb here) it would cheer every one up. Also, it be an amazing PR exercise for the train company. My cynical side, however, reminds me (in an annoying wittering voice) that there is probably a miriad of reasons why this is unlikely to ever happen, e.g. health and safety issues, number of seats, lack of carriages, lack of specialist train drivers, industrial action, personal injury claims, etc. Whilst I continue my daydream, you may wish to cast your eye over the photos below. The first is from the East Malling/Ditton/Barming avian blog and featured in a post on the 24th October 2007 (for train buffs: this is a 45407). 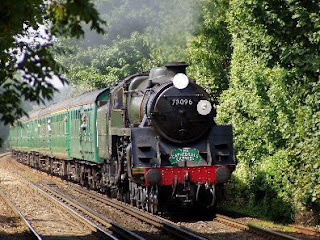 The second I found on the discussion forum of a website called Watercress Line. The post was by a Mr Hugh Topham on the 20th August 2003. He writes: "Saw 73096 today at East Malling Station as photo shows Passed through at 12:58 on its way to Canterbury on a Cathedrals". 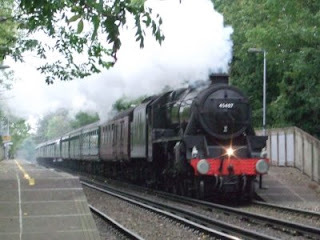 I expect there are more photos and information out there on steam trains and East Malling. If you have anything to contribute, please let me know.